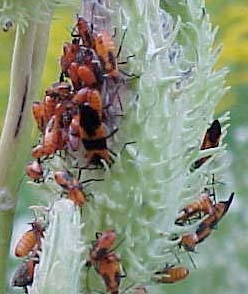 Because both large and small milkweed bugs are frequently seen on daylilies, they are included here for identification purposes even though it is not yet clear whether they are actually doing any damage to the plants. 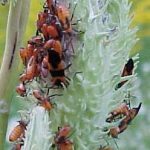 They both belong to the Seed Bug family, Lygaeidae, and are considered to feed mainly on milkweed seeds by inserting a beak into the seed and injecting an enzyme to aid in digestion. The toxins contained in milkweed do not affect them, but ingesting them results in the bugs becoming unpalatable to potential predators. They occur throughout most of North America. 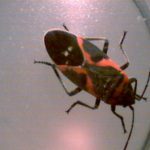 The large milkweed bug, Oncopeltus fasciatus, often appears in large numbers near buildings in a similar fashion to the related boxelder bug, for which it is often mistaken. It is roughly half an inch in length. 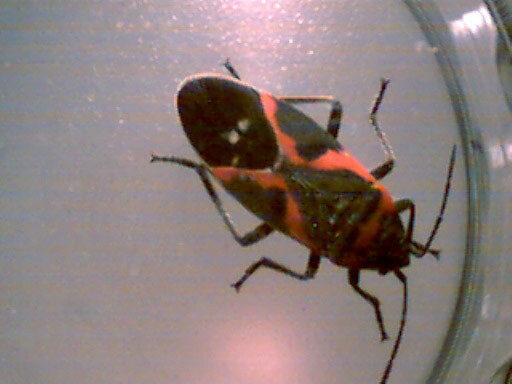 The small milkweed bug, Lygaeus kalmii, is slightly smaller and has a somewhat different black and red pattern often with two small white dots at the rear. Both produce one or more generations a year. They are frequently observed mating, facing away from each other, and remaining in this position for up to half an hour or more. 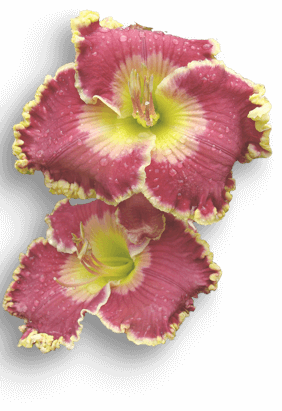 No controls are suggested at this time in view of the current lack of knowledge regarding the significance of their presence on daylilies.